Photo by Richard Nolan / Unsplash. Isn't it funny that we jump in cars to bask in the beauty of the great outdoors? Here are a few ways to stay mindful about that on your next road trip. In a perfect eco-friendly future, we would all take road trips in autonomous vehicles that would never emit harmful greenhouse gases nor dare turn against us. That, or we would all stay local and travel via virtual reality. Neither are happening anytime soon, so why don't we all learn to respect Mother Nature as best we can when we hit the road. After all, caring for the environment isn't an all-or-nothing affair. Here's what you can do to lower your impact while traveling by car. There's a sense of reckless abandon in driving for long distances, sure, but do you need to push the pedal to the metal every time you hit the road? Understand how your itinerary impacts the environment with Carbon Footprint, a browser extension that estimates carbon dioxide emissions for routes suggested by Google Maps, as well as the number of trees you would need to plant to offset them. If that strikes close to home, consider staying local — RootsRated will show you the best outdoor experiences near more than 30 U.S. cities, saving you (and the environment) costly mileage. Even if you're leaving and never coming back, you can always cut back on what you pack. After all, the heavier the trunk, the harder your engine has to work, the more gas ends up guzzled. Being critical about what you consider essential (and opting for reusable supplies over roadside pickups) is one way of reducing your impact. Recycled and up-cycled goods, like a weekend duffle made from plastic bottles by Hamilton Perkins, is a small but meaningful gesture too. 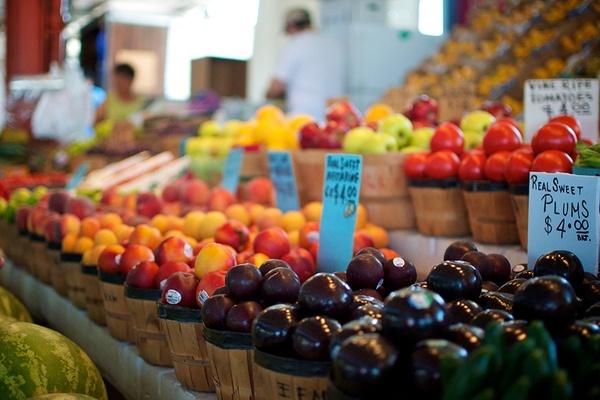 Find a farmers market wherever you are. Growing fruits and vegetables contributes far less greenhouse gas emissions than sourcing animal products, so you're doing everyone a favor by opting for fresh, local produce over run-of-the-mill rest-stop cheeseburgers. Look for green options on FarmStand, an app that helps you find nearby farmers markets, and HappyCow, a database of vegan and vegetarian restaurants in more than 180 countries worldwide. A farmers market in Dallas. Photo by John Tornow / Flickr. Try it on a hybrid. Photo courtesy of iKamper. Think small if you're booking rooms on the go, as most big hotels have large footprints (thank wasted breakfast buffets and 24/7 air conditioning). Planning ahead? It should be easier, but you'll have to look through travel blogs and plenty of search engine results to find quality eco hotels. 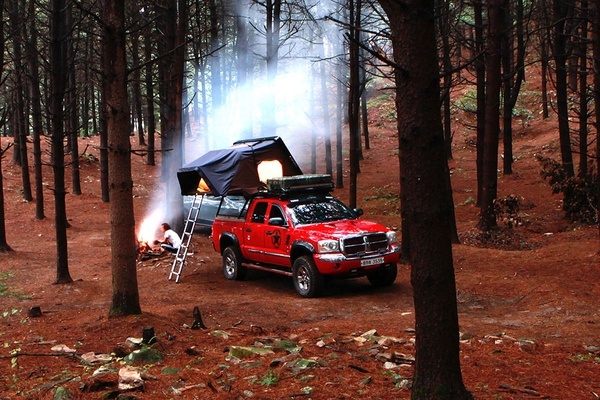 That, or you can invest in something like an iKamper, an expandable hard-shell tent that turns your car roof into a room that sleeps a family of four. 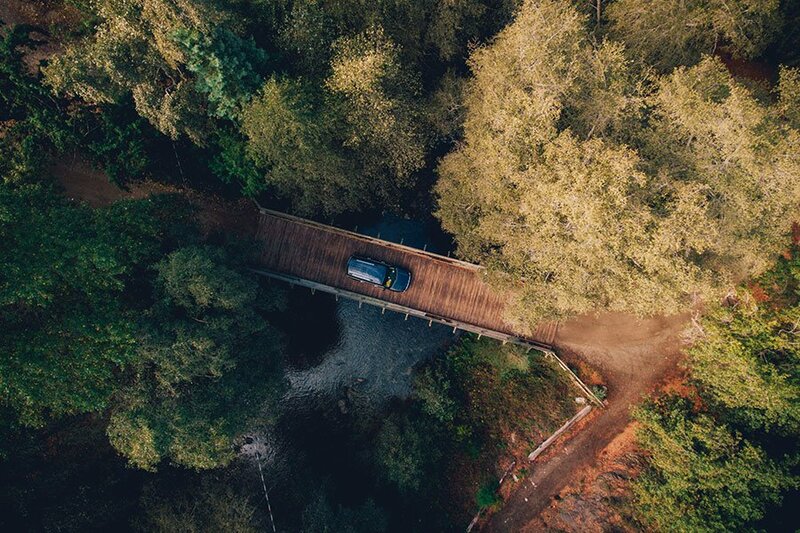 If you're taking a road trip across Europe, the United Kingdom, Russia, India, or Mexico, consider carpooling with BlaBlaCar, the popular France-based company that helps travelers share rides between cities. Trips are affordable and not sketchy — users are rated and reviewed like they are on Airbnb, so everyone knows who they're driving with. In the U.S., BlaBlaCar isn't available and there are no similar alternatives. Peer-to-peer carpooling isn't mainstream because it's not cost-prohibitive to drive in America, yet. GreenMeter uses your smartphone's accelerometer to detect when you speed up too quickly or break too suddenly in order to improve your fuel efficiency and lower your environmental impact. GiveO2 tracks your carbon footprint while driving and helps offset it by automatically investing in sustainable projects of your choosing.